The Sinn 140 and 142 Series have been two of the most historically important watches since the company was founded. Both series have become famous in watchmaking and space flight history. The German physicist and astronaut Reinhard Furrer wore the Sinn 140 S on his wrist during the D-1 Spacelab mission in 1985. He was therefore able to demonstrate that automatic watches can function even in a weightless environment. In 1992 the German astronaut Klaus-Dietrich Flade took his Sinn 142 S along with him on the Mir 92 mission. Although the original Sinn 140 St has long since been retired, Sinn has now subjected the 140 Series to further refinement, technology and development, and introduces the 140 St series as offering the "very best of Sinn". 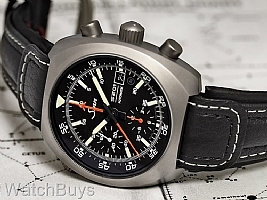 Many of Sinn's earlier 140 and 142 chronographs used the Lemania 5100 (and 1341) as the base caliber. This movement proved to be quite popular especially with the military who approved its use primarily based on its use of a large centrally mounted hand to show elapsed minutes. Since that movement was discontinued, and other chronograph movements did not support these displays, Sinn announced many years ago that one of their goals was to create a number of in-house modifications to replicate the functions of the Lemania 5100. Little did Sinn know the extent of the modifications that would be necessary, and that this project would extend over seven years. Specifically, Sinn shows the elapsed minutes through a centrally mounted hand with a distinctive airplane pointer. The watch also features a centrally mounted elapsed second hand as well as an additional time second hand in the register at 9 which runs irrespective of the chronograph. The result is an easy to read timing system with a large central hand that counts elapsed minutes on a 60 minute scale rather than 30, and a minute stopwatch scale which is visible around the entire circumference of the dial. The Sinn 140 St features an all Tegimented case construction. Standard steel used by most watch companies has a hardness of between 200 and 240 HV (Hardness Vickers is a common scale used to measure material hardness). The Tegiment layer has a hardness of 1,200 Vickers which is up to five times harder than standard steel. Sinn has found that filling the case with inert gas can help prevent the introduction of moisture and humidity to the case, as well as provide a more stable environment for the oils that lubricate the movement. This inert gas mixture, signified by the Ar symbol on the dial, is used to fill the watch case prior to being sealed. This will prevent air from entering the watch case, which will promote a dry and stable environment, but also prevents the dial and crystal from fogging. The second aspect of this technology is a dehumidifying copper sulfate capsule that absorbs unavoidable diffused atmospheric moisture within the watch, thus slowing down the aging process of the movement inside. A second advantage is that any condensation that were to develop does not appear underneath the crystal, even in very humid weather conditions. The dehumidifying capsule turns various shades of blue according to its degree of saturation, displayed through a small sapphire crystal window. In conventional watch designs, the chronograph pushers and crown shaft are mounted in the via an insert tube. This tube requires the use of a tube seal and provides a potential source of gas diffusion (in watches featuring Dehumidifying Technology), but would also allow for water to enter the case if a chronograph pusher were inadvertently pushed or a crown was left unscrewed. This is because the pusher and crown can shift in the tube if exposed to lateral movement which breaks the seal and allows moisture to penetrate the case. Likewise, with the crown, there is a similar risk that exists when it is unscrewed to make an adjustment. Sinn developed the D3 System to prevent this risk as the Sinn D3 System features chronograph pushers and crown shafts that are mounted directly into the case – thus creating a perfect seal. The D3-System permits the crown and push-piece to be integrated into the case, providing reliable protection from lateral knocks and the penetration of dust or moisture. The Sinn 140 St features 100 meters of water resistance and come equipped with a black calf leather strap with white contrast stitching and signed Sinn tang buckle.